Now, I'm not a huge Football fan or anything, but Oakland is so near to me that I just HAD to support the Raiders. Once that is done, let's get back to the CoTD. Gravity Bind. One of my most favorite Trap cards released so far. It stalls your opponent if he's playing Beatdown until he can remove GB or at least get a Jinzo out. It's great in Exodia decks. You can also make a good Gravity Bind decks by playing Crass/Dream Clowns, Hayabusa Knight, White Magical Hat, Goddess of the Whim, Giant Soldier of Stone, and some others. It's a really effective card in the right deck. That's why I'm giving it a high rating. is use with all the Weenie monsters, Dream Clown, Cannon Soldier, etc. being everywhere, it will hurt this card badly. Conclusion: Use this card wisely. You will feel like a big fat buffoon! Rating? 4.0 a real solid control deck staple. Gravity Bind is the card that many deck types arose from. This card pretty much single handedly made Exodia, Burn, and Weenie decks viable in tournament formats [As well as CC ;)]. With the aid of Counters, Prohibition and the like, this card can completely crush the average beatdown that we see so much of these days. Against decks such as Velocity Prime and new age beatdown decks, you'll definately have to do more thinking and strategizing, but the win can be pulled off. The worst part to Gravity Bind, is that decks based around it get slaughtered by Jinzo. So having a plan ready just incase they summon Jinzo is very necessary. Also drawing a Gravity Bind when you already have one on the field can be slightly annoying. Especially if you crucially need a card to give you game advantage. Ah yes, the card that everyone loves to hate. 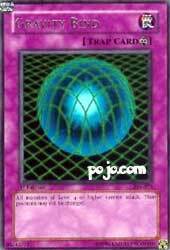 When beatdown users see this card, they moan and groan. If they don't get rid of this thing, or get out a Jinzo, they're in, like, trouble. Your Hayabusa Knights, White Magical Hats, and Dream Clowns are free to run amok under the protection of binding gravity. Heck, your Jinzo #7's are free to do almost what they want, just watch out for opposing Hayabusa/WMH/Dream Clown :/ I would be careful 2nd/3rd game, though, because if they swap in a Prohibition and Prohibition Gravity Bind, you lose unless you also run Messenger of Peace :/ This card works excellent in Dream Clown decks, Exodia decks, burner decks, and stall decks. Beatdown decks, you COULD run it as tech to create a field-wide lockdown (similar to Thousand-Eyes Restrict), but if you can't get it off the field, you could be in trouble. This guy is lockdown in a bottle, all you have to do is open the cap. I like this card. Some people would say otherwise because most people run cards that are level 4 or higher, AND because the level 3’s that people use are useful (Hayabusa Knight, etc. ), but this card, when in the right deck, can spell horror for your opponent. If you run a deck like “clown control”, this card is a must. It prevents your opponent from attacking, and gives you a lock, allowing you to attack with clowns or hayabusa knight, etc. If you run a beatdown, obviously, this card is going to screw you over royally, needless to say, don’t run it. If you run an Exodia deck, this card will allow you to stall to get out more pieces, most of the time, so is definitely one for the main or side deck. Combine with Labyrinth wall for a great stalling opportunity. Combining this with level 3 effect cards could save you in a tight spot. The card is great for a stall deck. It has its ups and downs, and I find it very useful most of the time. I give this card a 4/5, If you aren’t running a beatdown, I’d say put it in your sidedeck for sure, it will allow you to stop a beatdown opponent dead in their tracks, and it will allow a stall for time if you need it.